This machine is used to grind seats on springs made from large wire. Rotating the spring while grinding helps maintain precise angularity. 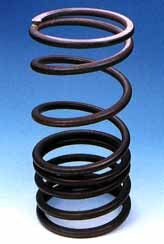 An additional benefit is that no special spring holding mechanism is needed.